Vacation rental house. 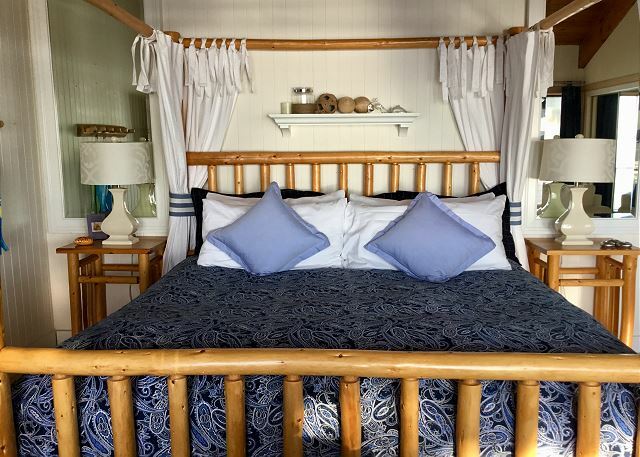 Sleeps 9, 3 bedrooms, 2 bathrooms. No pets allowed. Welcome to Oceanfront Sun Bright Le Reve! Deck seating over the water feels like sitting on the deck of a cruise ship. Stepping back here is a view of the house and yard. Sunny south side of the house. In the distance is the stairs to the beach and a buoy for a boat. Western exposure for glorious sunsets! A view from the water at low tide. 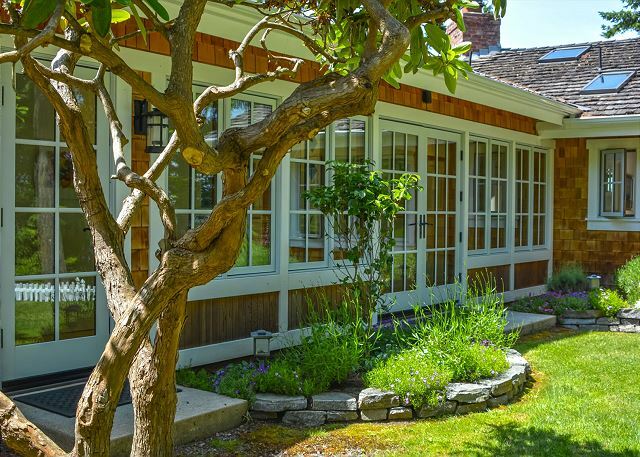 Beautiful gardens along French style windows. A view of the waterfront steps and deck. Steps lead down to the beach for easy access. Kids will love the open grassy area between the fruit trees and the home to run around in and play. Freeman Island is located right across from the house. Flower beds full of lavender surround the home. At low tide you can go down to the beach and explore the sea life. We don't count this as an additional room but the little ones might spend their whole vacation here. Welcome inside - an entryway table greets you with beautiful artistic decor. 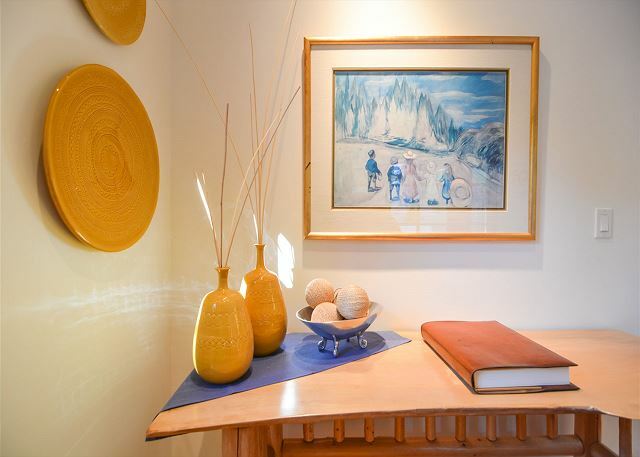 The owner, a world traveler, has placed beautiful, tasteful art work throughout the house for your, and her enjoyment. 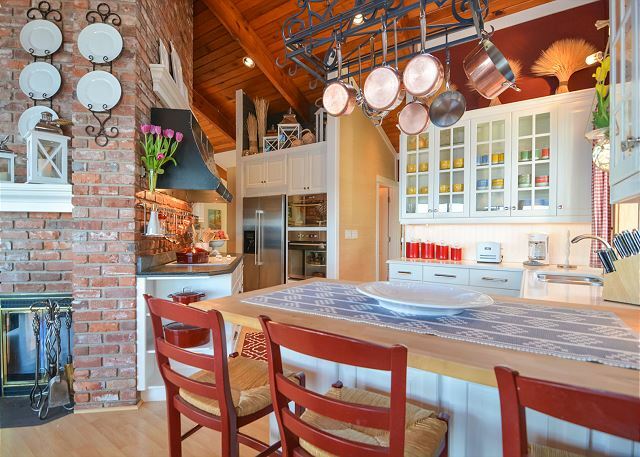 Entering the living room you will find a red brick fireplace and a wonderfully cozy setting. The kitchen and dining room are to the right. The entry hall is on the left and the bedrooms are further left. 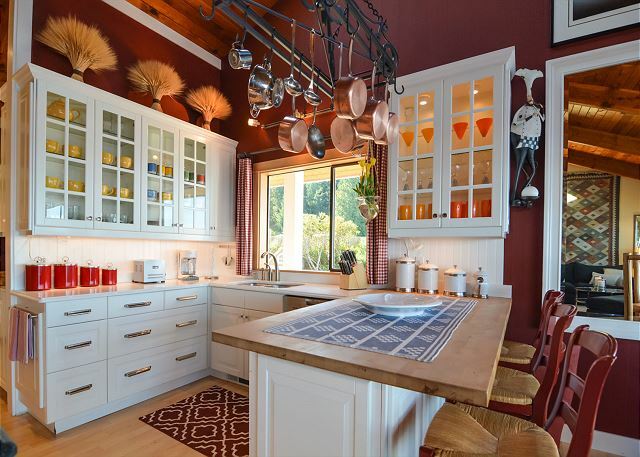 The bright and spacious kitchen. 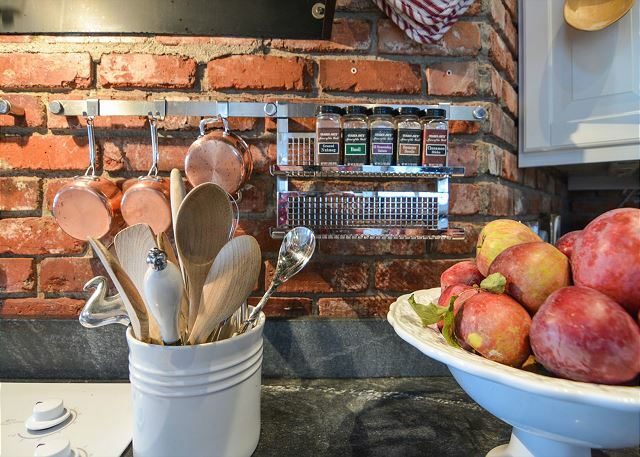 Breakfast counter and stove top on the back side of the red brick fireplace. Copper pots and pans with a bowl of apples picked from the property. 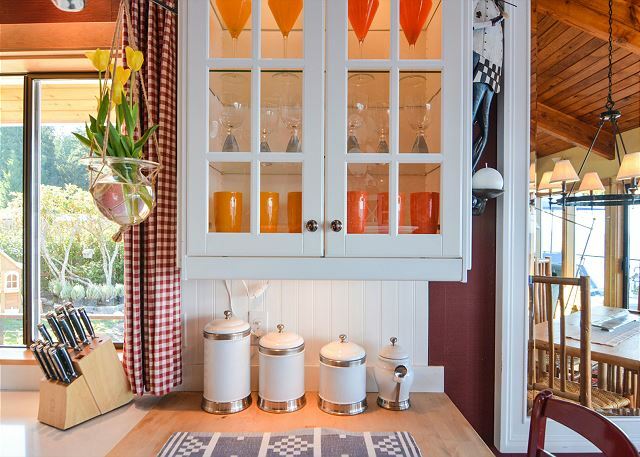 Colorful dishes seen through glass door cabinets. 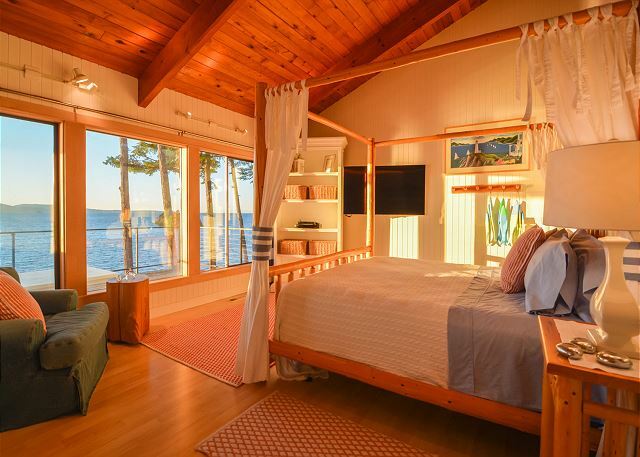 The master bedroom features a wall of windows for maximum waterfront views. An ultra HD curved TV is mounted on the wall for bedtime viewing. Master bedroom with four post bed. The bed room also features a writing / computer desk which is perfect for a quiet place to work. 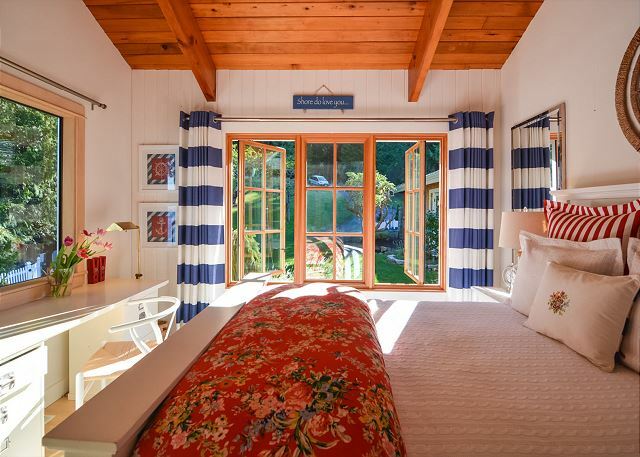 This guest bedroom features French windows that open on the gardens. Not pictured is an ultra HD curve TV mounted on the wall for viewing from bed. 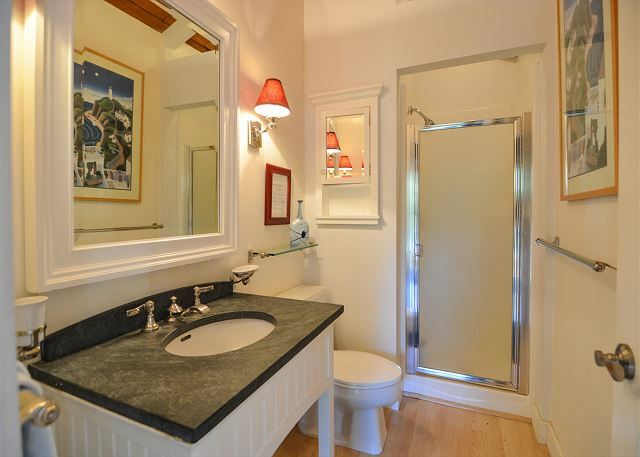 A shared full bathroom is just outside the door of this bedroom. 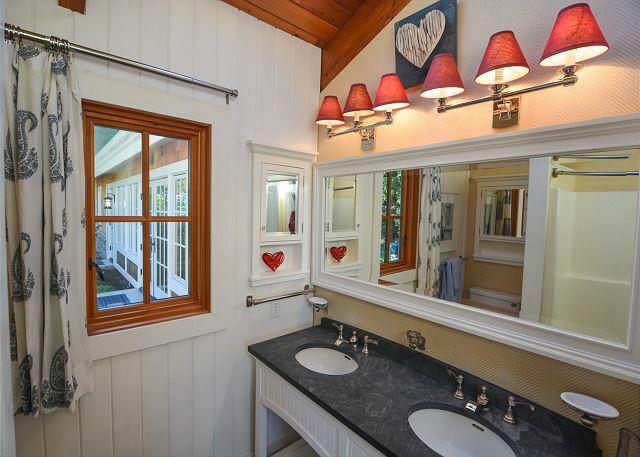 Double sinks in the shared full bathroom. 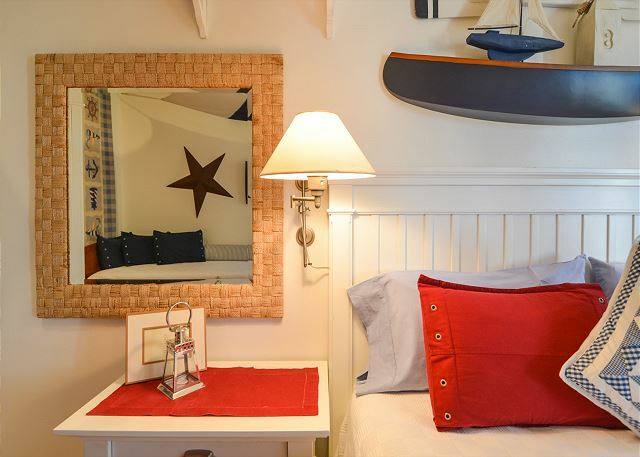 A large king bed is located in the spacious second bedroom, which is quiet and great for families. 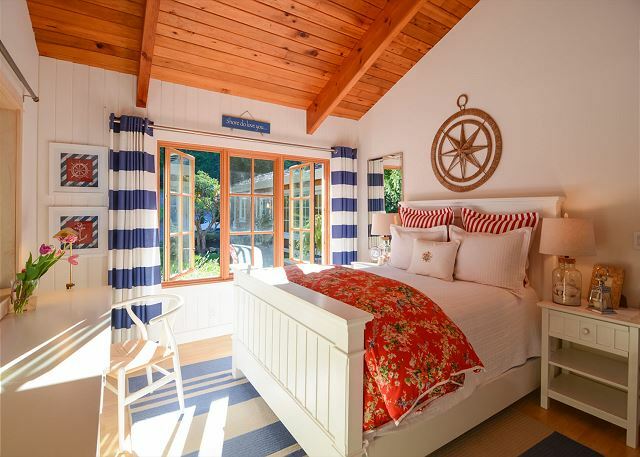 It features a unique boat bed with two single beds. 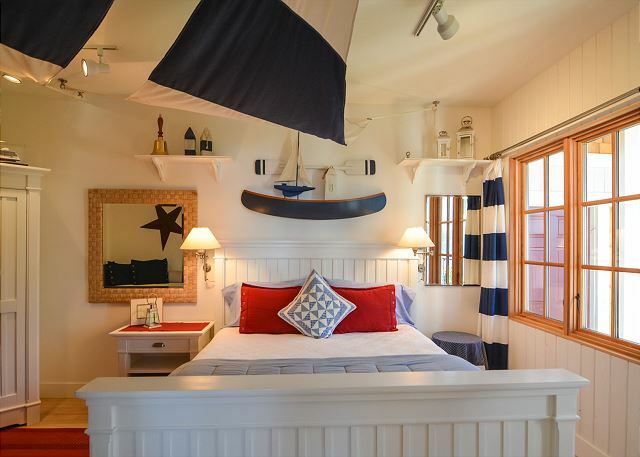 The second guest bedroom presents a nautical theme. Bedside end table and lighting. Second full bathroom with walk-in shower. Beautiful flower beds along the home. We hope you have enjoyed your look at Oceanfront Sun Bright Le reve. Here is a last view of the interesting rock formations at low tide in front of the house. 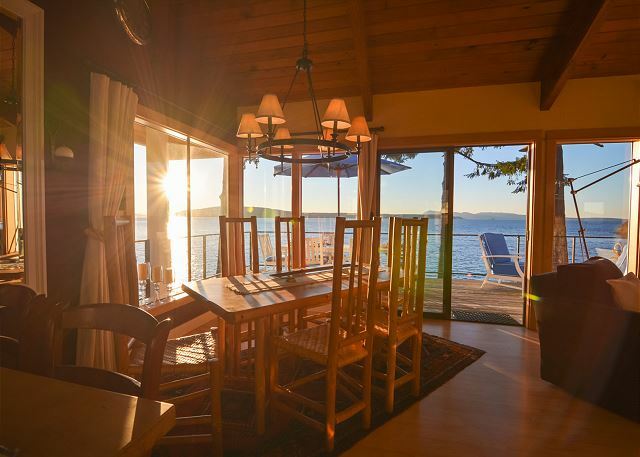 With one eye looking out over a west-facing golden colored sea, and your other on the crackling flickers of flame cast by a cozy fireplace, vacation mode is sure to come easily. 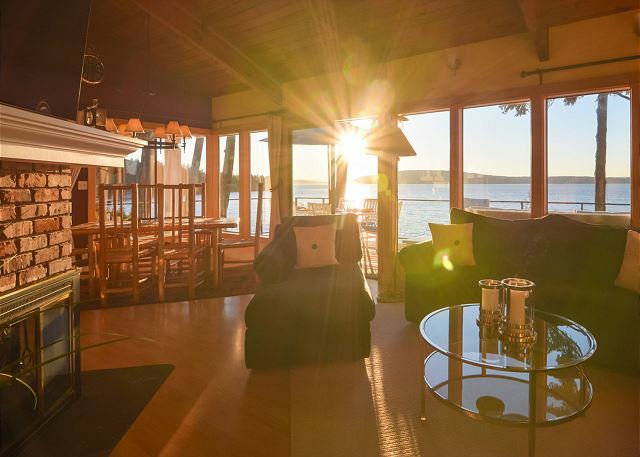 Relax and watch the flickering flame and sunlight meet and dance around this spectacular waterfront rental. 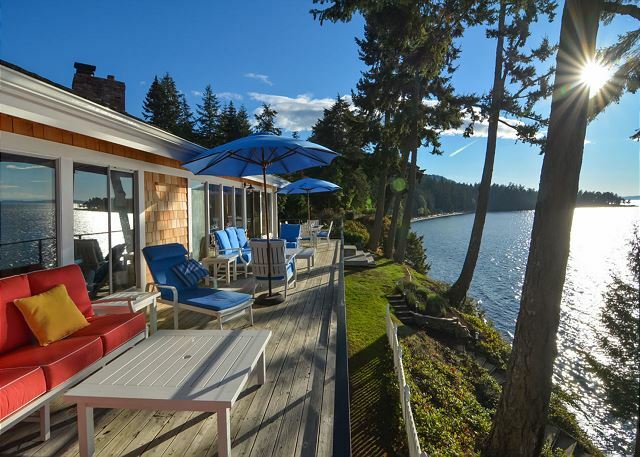 Large windows with a walk-out deck give the home an infinity pool-like feel over the ocean. 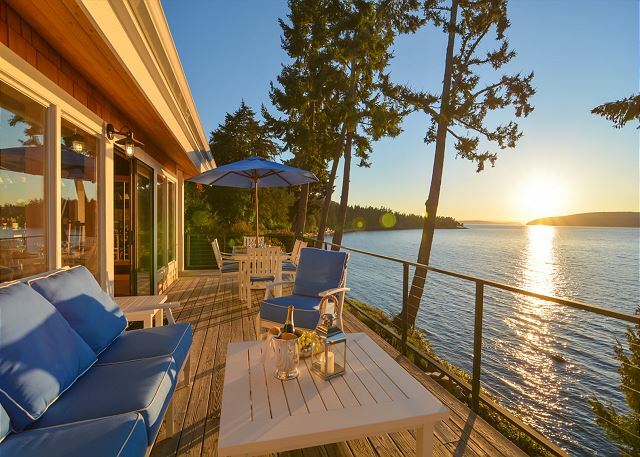 This home provides a 180-degree stunning view, perfect for gazing out at passing boats, distant islands, and the ever changing landscape. Sunlight permeates this home throughout the entire day, culminating in a tremendous glistening effect near sunset. The home is staged with beautiful décor, art, and high end finishes which only add do the magnificent layout and location of the home. 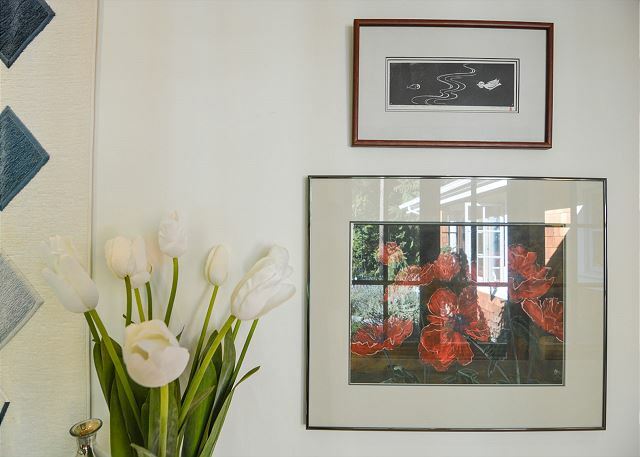 Upon entering the home, you are greeted with an eminently long hallway that features a variety of art work. 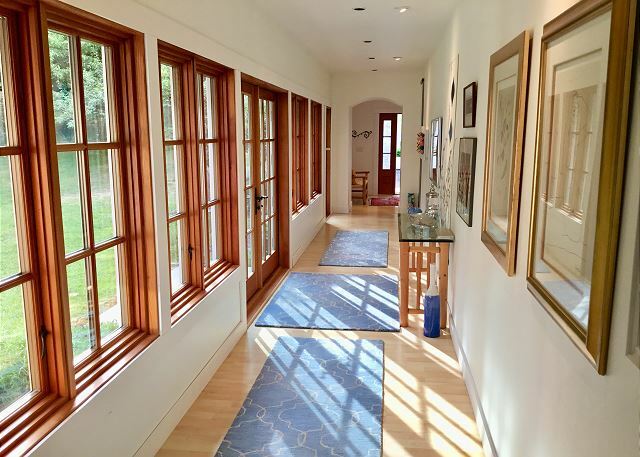 The art is well-lit by the opposite wall of French windows and doors. The end of the gallery-like hallway features the reveille of high ceilings, cozy couches and seating in front of a classic red brick fire place with an Ultra HD smart curve TV with 3D and Blu-ray plus 250 satellite channels. The fireplace creates a warm and cozy atmosphere in the evenings. Next, find a locally made artistic log dining room table and counter seating. The back side of the brick fireplace features a spacious kitchen which also takes advantage of the wall of windows and gorgeous views. 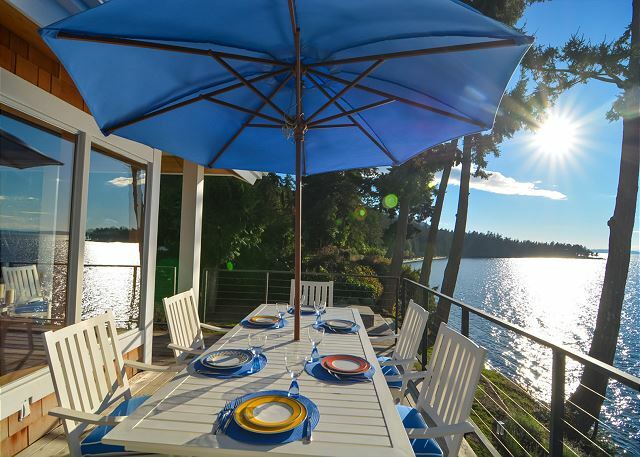 The patio doors open up to a walk-out deck where most people choose to enjoy their summer meals. For the chefs in your group, consider taking on the challenge of picking your own fruit from one of the property's many fruit trees and baking a pie for dessert. Outside, a stairway leads down to the beach area. Tide pools and beach combing are perfect at low tide. There is also a nice deck area for storing your kayak when the tide rolls in. 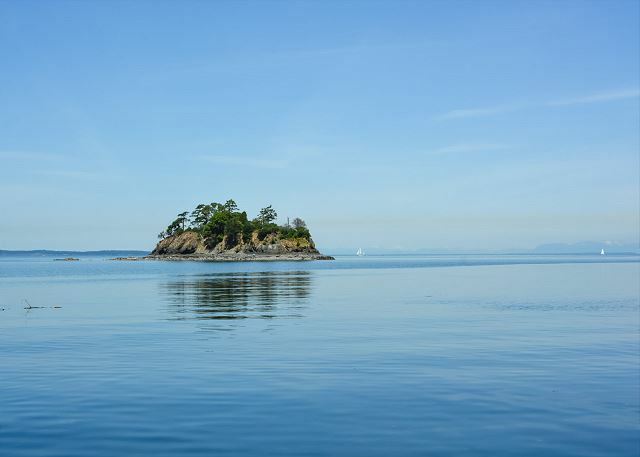 Guests will enjoy kayaking out and around a small island known as Freeman Island located no more than 300 yards off shore of the property, or to Point Doughty, a bit farther away. 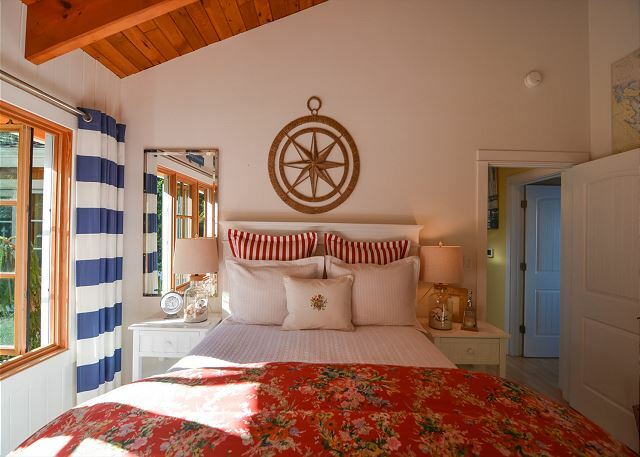 The home also features its own mooring ball for those that prefer to keep a boat accessible during their stay. President’s Channel is known locally as prime crabbing & fishing grounds and this in turn draws rich bird life. Eagles are everywhere scouring the dramatic shoreline which at low tide is fascinating to explore. 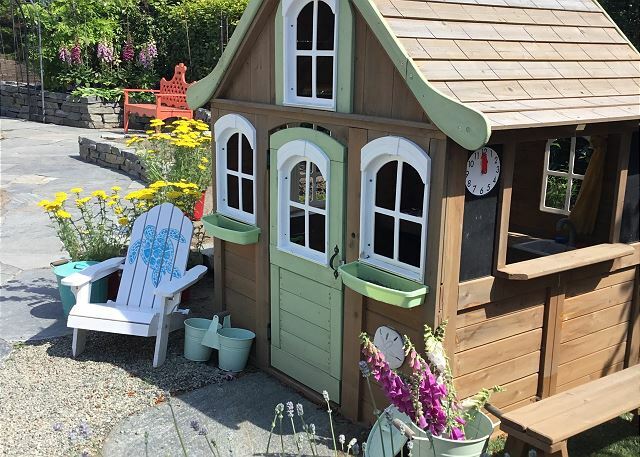 Young kids will enjoy playing among the grassy hillside fruit trees, and adorable play house. Lavender gardens draw constant butterflies and hummingbirds that only add to the magical setting. Located at the end of a dead-end private road, the property has a secure and quiet feel. 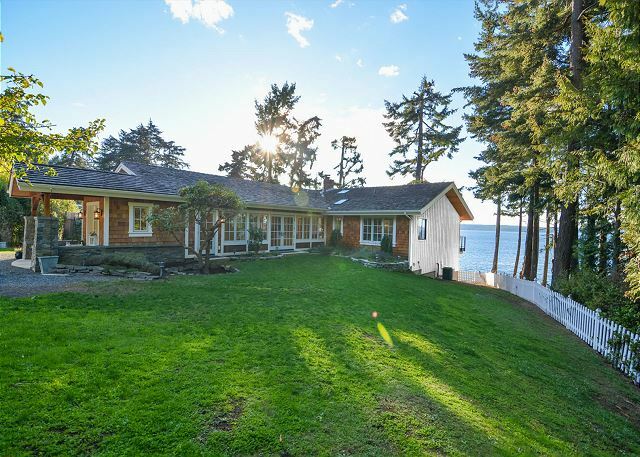 Eastsound Village is a 10 minute drive. NOTE: This home can only be rented in increments of 7 days only with check-in allowed on Saturday only. Travel Insurance – Unexpected Things Can Happen, We Highly Recommend You Purchase Travel Insurance. 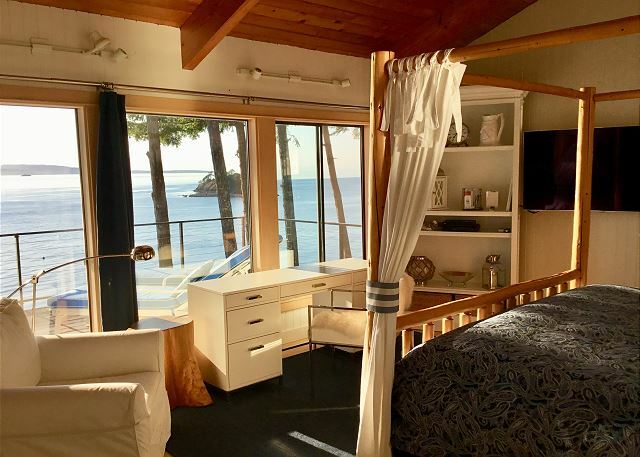 Northwest Island Escapes makes every effort to provide, and provide timely maintenance and service for, all the amenities listed in this property description. However, at times, due to events out of our control, these services may not be as fast or reliable as our guests are used to on the mainland. Very comfortable home. 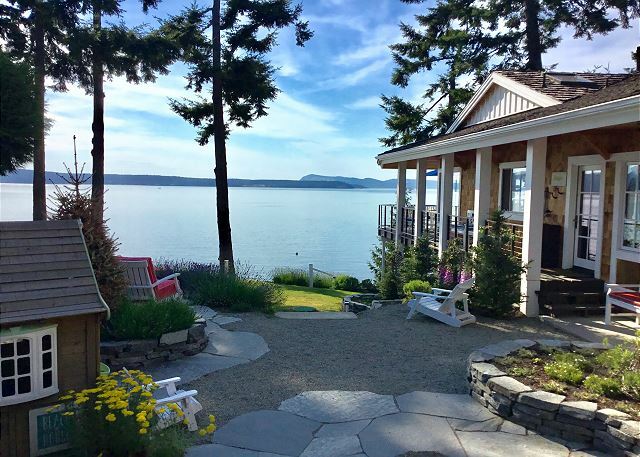 Great location with beautiful water view. One complaint is that the back bedroom smelled very musty, almost like urine. Luckily it was warm weather so able to keep window open which helped. 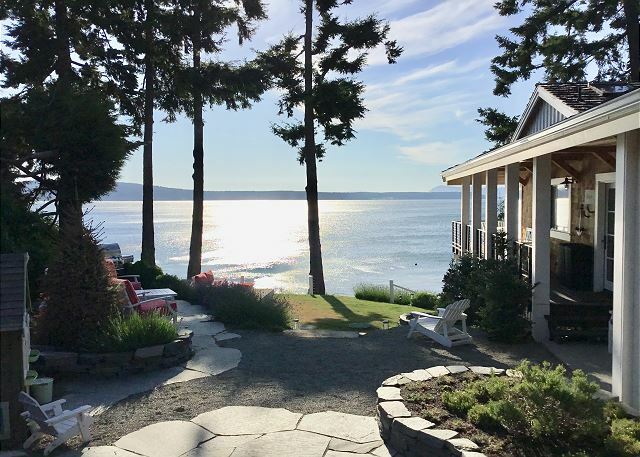 Karen, Thank you for your review and mentioning what a truly wonderful water view and access this home provides and that you would recommend it to others. Seeing your review about a odor in the back bedroom, we immediately visited the home and went back several additional times to see if we could detect any negative odors. We could not duplicate what you smelled. The furnace in this home had just been replaced and the HVAC contractor had warned that the new system could give of some odor on an extremely short-term basis. This is the only explanation we could come up with. As any potential guest can see, the reviews for Sun Bright have been nothing but stellar. We must believe it was a one-off type of coincidence. No odors before or after. Sun Bright's 3 bedrooms were a perfect fit for our family get together with daughter and son-in-law from NYC and daughter from Kansas City. 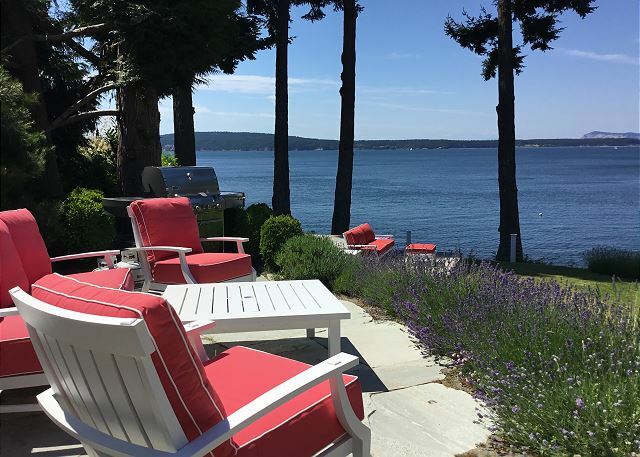 Orcas has lots of activities for a family like ours that includes both marathon runners and some whose idea of a perfect vacation is sitting in a chair with a view and a good book. While the more energetic family members did the hikes up Mt. 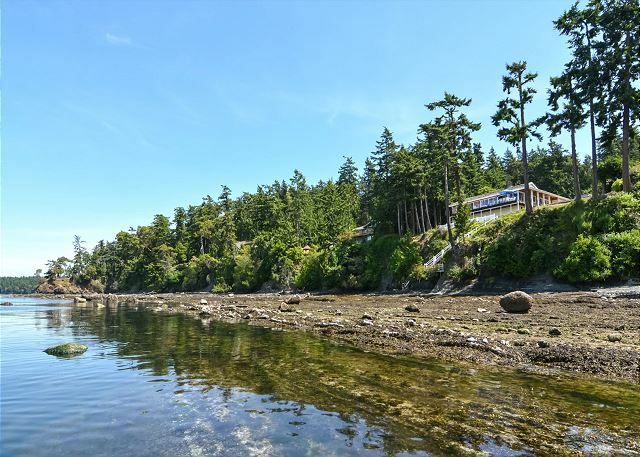 Constitution and Turtleback others enjoyed the fabulous view and wildlife spotting from the deck. 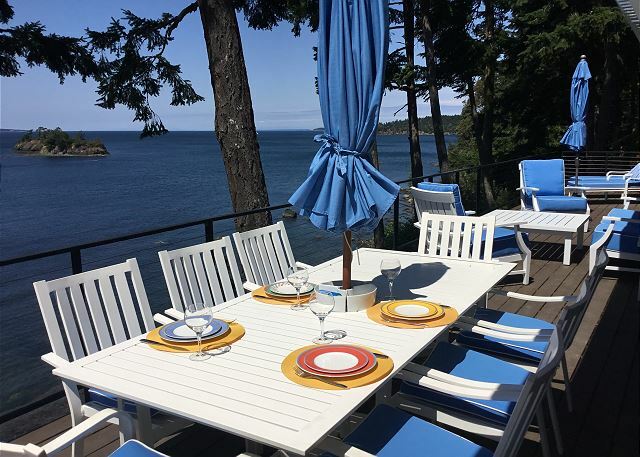 We are all foodies and enjoyed a combination of dinners out at fabulous Aelder and Inn at Ships Bay and King Salmon on the grill with local vegi's and fresh bread from Rose's bakery. The kitchen is very well equipped for serious cooks and the view from the dinning table can't be beat. We had a fabulous time! The home was beautiful, well appointed and so very comfortable. The view was outstanding, we saw eagles, otters, seals, a deer swimming and then running up our hill. We even saw Orcas off in the distance! It was a hike down lots of stairs to the beach, but very doable and good for the legs. Crabbing wad great and we rented kayaks that were delivered to the house. Great having all my kids and spouses in the same house! Hope to rebook soon! The kids said it was even more beautiful than the pics! We had a terrific stay at the Sunbright house. It's aptly named. There was one small problem, we couldn't find the waffle maker. I think someone missed took a grilled cheese sandwich maker for a waffle maker. We just made pancakes though, not a big deal. Loved it! Will be back. Our stay was an exceptional experience! I do believe the view from the deck was the most beautiful one that I have ever experienced from any of the places we have stayed in our travels! The home is lovely and elegantly decorated. We have hopes of returning to rent again some time. 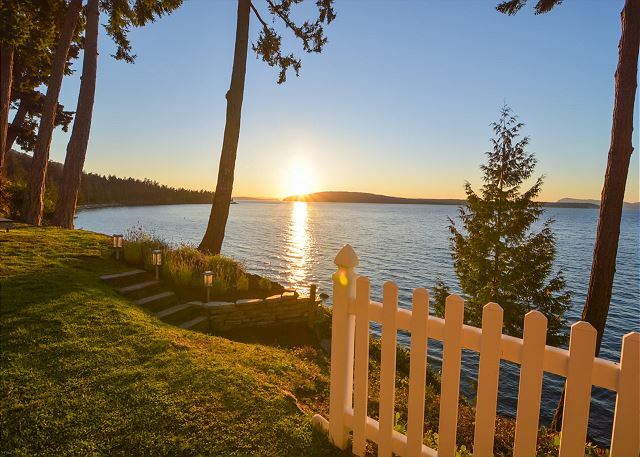 This is a nice property with solitude and a beautiful view. Lots of wildlife. The house is cute and well furnished. The inside feels rather small as a lot of the square footage is in one long/wide hallway but it has a lot of outdoor living space. The house is in very good condition. Beds are comfortable with lots of down pillows. 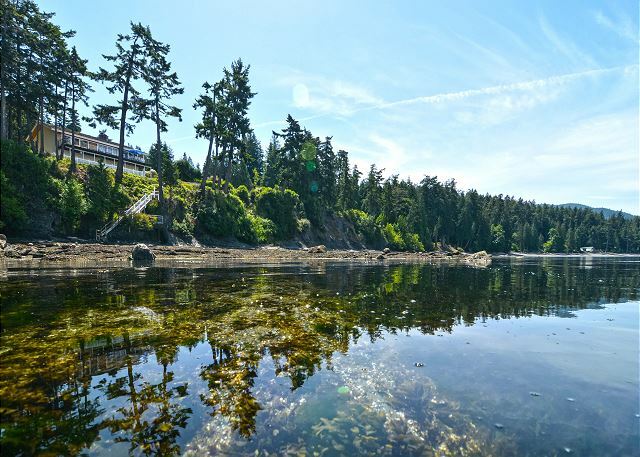 The beach is very rocky and you must stay on the beach area just in front of the property. Ther are tons of tiny crabs, anemones, tiny shrimp, snails down there but it is very difficult to explore because you are crushing them all as you walk. Phone rings daily, solicitors or calls for the owner maybe. We had an issue with TV function, not enough towels, and a mouse inside one of the bedrooms, but the management company responded promptly. Overall, I would highly recommend this property as long as you don't mind close quarters.